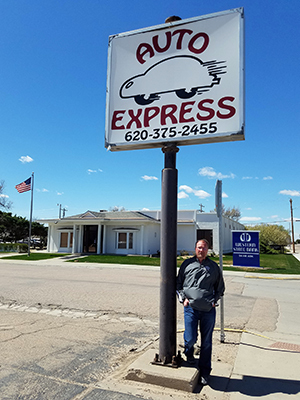 After a dozen years as owner and operator of Auto Express, Brady Harbin is moving across the street. Brady Harbin has owned Auto Express in his hometown of Leoti, Kan., for 12 years. Harbin will move across the street to Western State Bank on June 1. On June 1, the 39-year-old Leoti man will begin work as an agricultural/commercial loan officer at Western State Bank, just west of his dealership across Second Street. “The opportunity to serve this community in a greater capacity came up, and I couldn’t pass it up,” said Harbin, a 1995 graduate of Wichita County High School. “This is where I grew up, and this is where I want my kids to continue to grow up. Family has always been a big part of his life, but so has community. He is a volunteer firefighter and is one of the many people in Leoti that donate their time to the annual Wichita County Fair Association. He also is a member of the Wichita County Economic Development E-Community leadership team and a member of the Leoti United Methodist Church. In fact, it was that sense of giving that guided Harbin back to town more than a decade ago. He began working in the auto industry as service adviser for Western Motors in Garden City. After two years, he was promoted to the finance office. When an opportunity came for Harbin to work in the sales department at the dealership, he considered all his options. “I decided that if I ever decided to sell cars, I wanted to do it on my own,” he said. “I was looking for a way to get back to Leoti and raise my family. It’s worked well for Harbin and his family. Renee Harbin is a business instructor at Garden City Community College, and their daughter, Bailey, is a freshman at Kansas State University; Madison is a seventh-grader; and Colton is in the fourth grade. That’s one of the reasons he felt so strongly about building his Auto Express brand in his hometown. The dealership has done that well. As the only auto dealership in Wichita County, Auto Express has become a major contributor to the area. Although he’s walking across the street toward his new career, he’d like to see someone take over the dealership and continue to service the community. For now, though, he’s excited about the next phase life has to offer.